Are you looking to host your event, whether for business or pleasure, in Cannes? How about getting a berth in Cannes in the prime location? If you are interested in obtaining a Berth at Cannes right next to the Palais des Festivals, along the Jetée Albert Edouard, Boatbookings can help you. form. This all then needs to be delivered to to Capitainerie (Port Office) and must be in perfect order otherwise it will be rejected – detail is key. Boatbookings has years of experience getting berths for our clients during shows such as MIPIM, MIPCOM and, of course, the Cannes Film Festival. 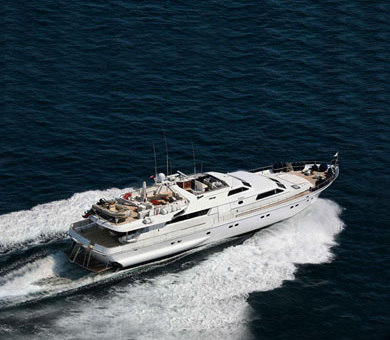 We would be more than happy to find you the perfect charter yacht and submit the berth application! As you can see, you need to be ahead of the game to obtain a berth, prepared with your charter yacht and ready to go, so charter with Boatbookings today. of room for you and your guests on board without it getting busy. ANTISAN’s interiors are neutrally decorated, fitted out elegantly with furniture in walnut and expertly matched pastel coloured fabrics. The living area has a spacious sitting-room with plasma TV and BOSE Sound System, which is great for putting on some background music while entertaining your guests, and a separate dining room. Outside on deck, ANTISAN affords a large cockpit astern with a table for 10/12 guests, while forward there’s a spacious sun-deck. 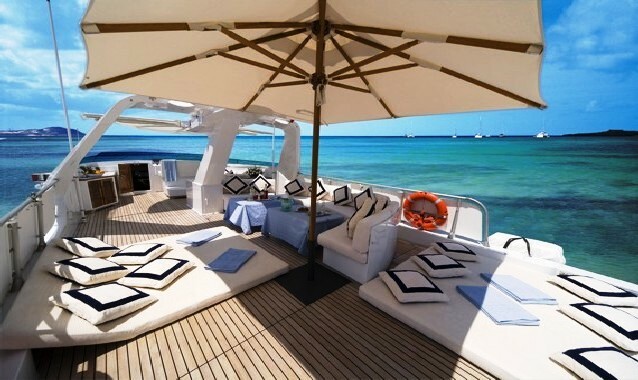 The enormous upper deck is certainly another of ANTISAN’s strengths; here you can lie on a large sun-deck or sit on the comfortable sofas in the shade of the bimini, which is also perfect for dinner under the stars.